Overcast most of today with some wind. Overnight low was 43F. The high today was 67F. Winds were light and variable. We got things loaded up and left Plomosa Road at 10:00AM. Cathy drove the Cherokee and I drove the motor home. 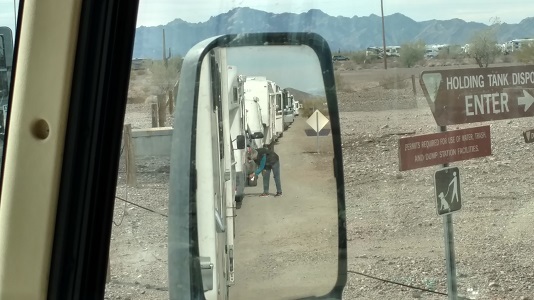 We checked into La Posa South and got in line to dump. Took 1 1/2 hrs. Cathy washed her hair while we were waiting. I had her wait, because I didn’t know if the water would hold out. 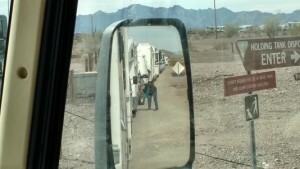 For some reason the fifth wheel ahead of us took more than a half our to dump. The woman kept coming out and filling a gallon jug with non potable water. Finally got dumped and parked. 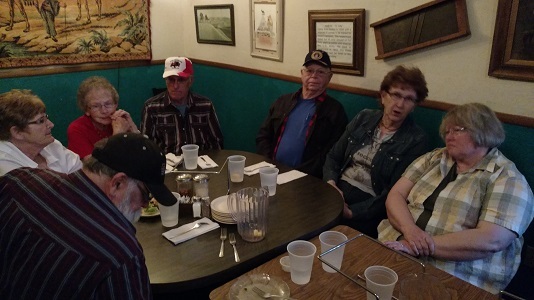 Shaved and changed clothes and drove to Silly Al’s to meet our WIT friends from Fargo, Chris and Joyce and their friends from the car club they belong to. They took a charter flight from Fargo to Bullhead City. Their friends from Nebraska, Harold and Helen got there at 11:50AM and saved a table. They spend the winters in Hope, AZ. Chris and Joyce and their friends from Fargo, Jack and Helen got there before us. It was very busy, but the food was good. I had lasagna and brought half home. After Silly Al’s we stopped at McDonalds for 69 cent cones. Got back to the motor home and walked Joy. We met the woman camped behind us in a pop up camper. They are from Vancouver Island and have been here since October. Had left over dirty rice for dinner. We got some South African Smoke Seasoning at Trader Joe’s and it was great on the dirty rice. Watched Corner Gas the Movie.